Veneers in San Antonio ~ Porcelain, Lumineers®, Empress® & More! There’s a reason why patients love our dental veneers. With just one treatment process, Dr. Voigt can create smiles that are flawlessly white and beautifully aligned. At Voigt Family Dentistry, our San Antonio veneers are able to provide the most natural looking and long lasting results possible. Porcelain Veneers - This approach to veneer treatment is the most popular and widely used method. Porcelain veneers are opaque enough to cover stains on teeth caused by medications, coffee, tea, or tobacco. As teeth are buffed before veneers are applied, porcelain veneers help patients’ smiles look straighter and brighter. 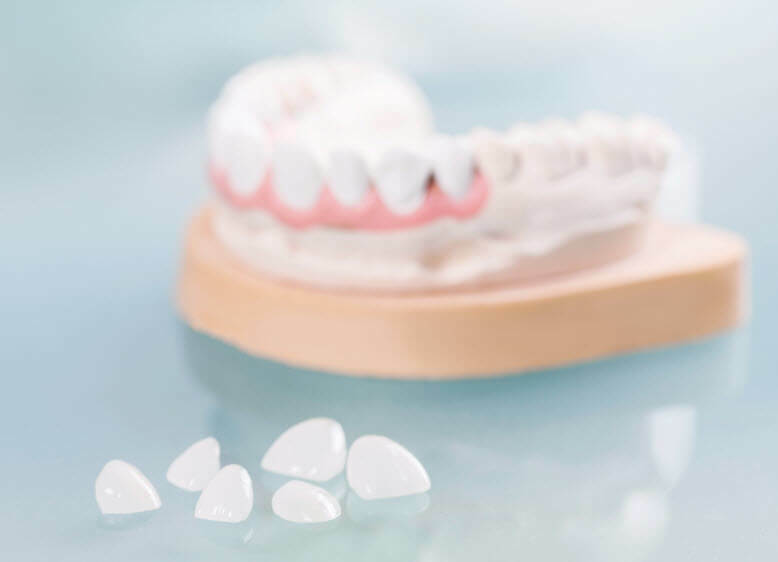 Lumineers® (No Prep Veneers) - For patients who prefer to avoid the minimal preparation process, and who quality for this procedure, a thinner version of the traditional porcelain can be applied to teeth without shaving dental enamel. This treatment, called no-prep veneers, isn’t ideal for everyone, but can provide for conservative dentistry for patients with small teeth. Empress® - While traditional veneers are made from porcelain, Empress® veneers are made from a durable and beautiful ceramic glass. Both porcelain and ceramic possess stain-resistant properties and are highly similar in appearance to natural enamel. Dr. Voigt recommends porcelain or ceramic based on how heavy a patient’s bite is or how discolored their teeth may be. Feldspathic Veneers - This special variety of porcelain is known for its beauty and ability to cover discolored teeth and look natural, even when fabricated to be ultra-thin. This material has a reputation as the standard for high quality veneer restoration and can be layered and customized to produce a precise shade match and overall life-like aesthetic. When determining which veneer treatment is right for you, Dr. Voigt and his staff select the best choices for a natural-looking effect and as much coverage as you need. Results from our veneers application don’t end up giving patients the chiclet teeth effect, but are natural and beautiful complements to the rest of your dentition. While total treatment turnaround for some patients can be as little as three to four days, typical time is just one week. Dr. Voigt sees many patients who want an overall whiter smile and is able to accomplish this effect with veneers. However, veneers also provide a solution for crooked teeth and spaces between teeth. In these cases, Dr. Voigt recommends a course of clear braces coupled with veneer application. Ideal candidates for veneers are patients with worn-down or damaged teeth that want to avoid extensive procedures. With veneers, patients’ smiles look refreshed and decades younger. We provide patients with everything they need to enjoy a stain resistant and naturally beautiful restored smile for years. Schedule your Veneers Consultation - Contact Us Today! For more information about what veneers can do for you, contact Voigt Family Dentistry to speak to a member of our team.